Heat the oven to 180 degrees Celsius or 350 degrees Fahrenheit. Melt butter in a pan and stir in the sugar and the golden syrup. Cook until the sugar dissolves. 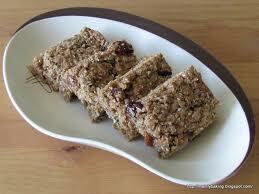 Remove from the heat and stir together with orange zest, oats, cranberries and figs. Pour into a nonstick baking tray and bake for approximately 40 minutes. Leave in the tin and once cooled, cut into even squares.